In Cult Eyewear: The World’s Enduring Classics, Neil Handley provides a rich history of eyeglasses starting in the late 18th century right up to the present. He skillfully educates us as well as entertains and enlightens via his study of this rarely examined accessory—eyewear is not usually included in the category of fashion accessory design books unless it is for non-prescription sunglasses. 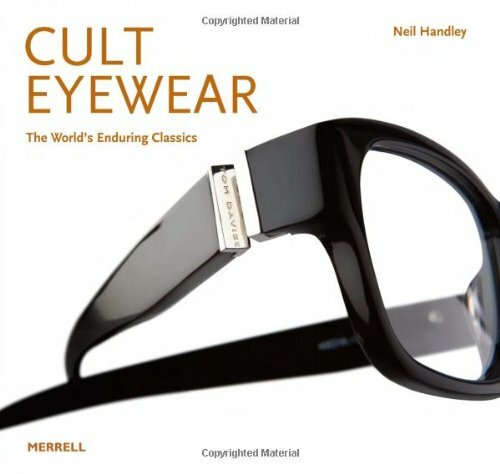 Because the topic is a rarity and because Mr. Handley serves up generous helpings of fashion information regarding both optional decorative eyewear and corrective glasses, Cult Eyewear may well be considered the sine qua non of books on the subject. If you own more than a couple of pairs of glasses or know someone who collects them, then this is the perfect gift. Anyone who keeps an eye on new trends in eyewear, cosmetic or prescription, will recognize about one quarter of the names/manufacturers/designers; but there is a larger segment of lesser known designers who have contributed to the advent of eyewear fashion statement. Have you ever heard of C. W. Dixey & Son, Kirk Brothers, Oliver Goldsmith, or Michael Birch? Do you know what a “shoptician” is? What about the extrusion process? And what the heck is a library frame or an optyl? The author answers these questions and many you never even thought to ask, but will find fascinating nonetheless.